Robotic space assistance plays a crucial role in the human race’s ever expanding space endeavors, as sustaining human life in space remains dangerous and costly. DLR-RM has a long history of space robotic missions dating back to the Rotex robotic mission on board the Space Shuttle in 1993. The institute sets a strong focus on interdisciplinary development of new space robot technologies. 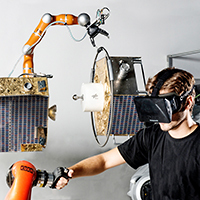 This includes the participation in internationally funded space projects and missions, as well as the development of arms for space applications, articulated space hands, and, of course application software. 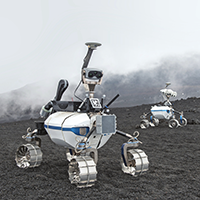 Planetary exploration robotics is the key for future space applications maximizing the scientific return, and reaching destinations – inacessible for humans so far. With DLR’s contributions we are continuing to be an essential partner for international missions to extraterrestrial bodies in our solar system. The term “fourth industrial revolution” has been used to characterize the current trends of digitalization in production, along with the use of flexible robotic systems. These trends are driven by a need for greater flexibility, due to increasing individualization and customization of products, along with shorter product life-cycles. Universal service robots are envisaged to revolutionize the way we live, from public services, over healthcare applications, to personal assistance. The robots required therefore have to be versatile, intelligent, and dexterous. By combining multiple robotic technologies such as perception, autonomous navigation and manipulation we have been working on systems for different field applications. Many of the technologies that have been developed for space applications, such as the DLR Light-Weight-Robot or the teleoperation and shared control methods, can effectively be used in terrestrial applications such as medical and healthcare.